See IT, Touch IT, Learn IT! – Three days of in-depth, hands-on training led by an industry expert who has over 30 years experience with all aspects of Fire Pumps. 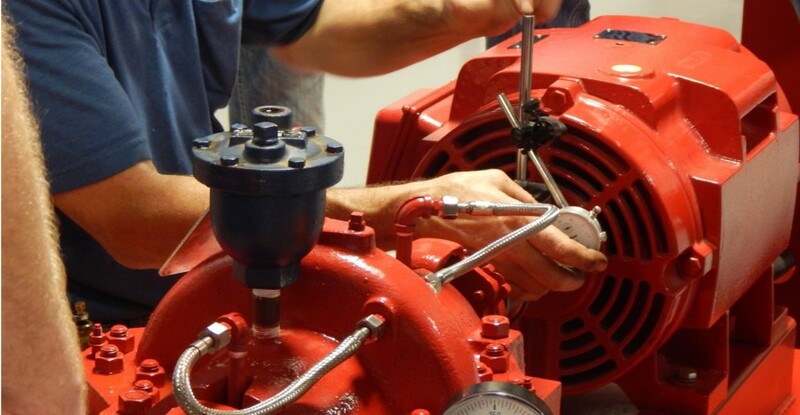 Learn the proper methods of troubleshooting and maintaining fire pumps. Fire Tech Productions, in association with SPP Pumps University, have combined forces to present this unique, all inclusive Hands-On Fire Pump Maintenance Workshop. For 3 days, your only concerns will be learning more about the troubleshooting and maintenance of fire pumps and networking with your peers. From start to finish, all meals, lodging and transportation will be provided. Prepare to get your hands dirty!! This three day hands-on workshop provides a rare opportunity for partial tear down and review of vertical in-line and horizontal split-case pumps. Taking the process through from beginning to end, and repeating it for several of the techs that stepped up for churn tests was excellent. Even a couple of our more senior techs mentioned that they learned a thing or two. Describing the how, the why and the reason for the action is very helpful, there were items from differing tasks demonstrated that we generally don’t do as a matter of course. We may look to see how we can adopt tasks into our testing as appropriate.